If you are looking for the best Ninja Blender on the market today, then you’ve come to the right place. SharkNinja blenders have grown popularity throughout the years because they function just like o﻿﻿the﻿﻿﻿﻿r ble﻿﻿n﻿﻿d﻿﻿ers but offer more convenience and features at an affordable price. Aside from making shakes and smoothies, they can make purees, nut butters, chopped vegetables, and even more. Because of the many functions that Ninja Blenders have to offer, they also come in a variety of models and designs. So, choosing one will depend on your needs and preferences. To make your choice easier, we’ve shortlisted some of the top Ninja Blender models and reviewed them for you. Below is the difference between ninja blenders. Where do you plan to store it? Because Ninja Blenders cater to the needs of its users, their product lines have branched out and can be categorized by its features and design. Their overall differences are between power, accessories, and functionality. Here are the top 6 different product lines of Ninja Blenders. There are different types of products under these categories so creating Ninja Blender comparison chart for all of these can be complicated and confusing. So, we decided to write a quick but insightful review for the top ninja blenders that are highly sought after for their features and reasonable price. Our review below will give a good overview of the 6 ninja blender models that we picked for you. We are confident that after you read it, you will know which ninja blender you should be buying. The Ninja Professional Blender with Nutri Ninja Cups BL660 gives you the option to blend in a 72 oz pitcher or the 16 oz single cups. It has 1,100 watts of power that comes in 3 speeds plus a pulse feature that allows you to control the chopping and processing of your food or drink. This can be considered the best ninja blender for smoothies as it can break down tough ingredients like whole fruits, vegetables, seeds, nuts, and ice to make smoothies and slushes within seconds. Che﻿﻿ck t﻿﻿his﻿﻿﻿﻿ post for more blenders for smoothies. The two single-serve cups are great for creating smaller batches of food or drinks. It’s handy for creating drinks especially if you’re in a hurry, eliminating the need for a separate small blender. This also comes with stainless steel blades so you can directly attach the cups to the machine and start making your drinks. The cup comes with their own lid as well. Overall, this powerful blender provides many features and functions and is strong enough to grind nuts into butter or make ice cream. However, it doesn’t fall as the best ninja blender for juicing because it doesn’t extract the juice from fruits or vegetables. You would have to add some liquid or ice to get your desired consistency. This Ninja Blender comes with BPA-free and dishwasher-safe parts to keep your food and drinks safe and chemical free. A standard 1-year warranty comes together with each purchase. It has a cord storage compartment for more space and organization in your kitchen. As a bonus, you can find recipes included in the box. The Ninja Mega Kitchen System BL770 is somewhat similar to the BL660 model but has more features and is more powerful with 1,500 watts. With all its inclusions, it provides you a complete kitchen system for making meals and drinks. The 72 oz pitcher that features their Total Crushing technology that crushes through ice and frozen fruits for creamy smoothies. The two 16 oz single serve cups are also great for creating smaller batches of drinks when you’re on-the-go. And the 8-cup capacity food processor bowl can chop ingredients or mix a 2-pound dough in 30 seconds. This is their highly sought after model because it is their most powerful food processor system. It also has 3 speeds and 2 additional mixing features such as the pulse and single service. These, including the stainless-steel blades, are all effective in crushing, mixing, chopping, and pureeing different ingredients. All its containers are BPA-free and made with SAN plastic and Tritan plastic to ensure that your blender parts are sturdy while keeping your food free of carcinogenic chemicals. All its parts are dishwasher-safe to make it easier to wash and clean. The blender also comes with a standard 1-year warranty but you have the option to add another 2 years of warranty with a minimal additional cost. Overall, this is a very useful complete kitchen system that not only acts as a blender but also as a food processor, so you get 2 products for the price of 1. Its 2+ HP motor can crush ice and other tough ingredients. It eases your job in the kitchen and does it within seconds while it lets you focus on cooking. The Nutri Ninja Pro Blender BL456 functions as a simple yet powerful personal blender that comes with 2 different sizes of food-safe plastic Nutri Ninja cups – 1 regular 24 oz and 1 small 18 oz, each with a spout lid. If you’re always on-the-go and are looking for a quick meal solution, then this model is a perfect choice. It has a 900-watt motor that can crush through frozen fruits and vegetable to make smoothies with even consistency while keeping most of the nutrients and is strong enough to process thick nut butters. The 24oz cup is enough to make a smoothie and the smaller cup has the capacity to grind seeds, nuts, and coffee. This BL456 blender is also excellent for making juice. Check out how to make juice with this ninja blender, here. One downside we found with this product is that you have to manually hold down the blender when it is turned on and blending. Another thing is the 24 oz cup can be a bit small for its powerful blender base and we think a larger 32 oz cup might be better in this case. This BL456 model replaced the BL450 model, and the only difference is the larger collection and better booklet that includes 75 recipes that require minimal time and effort. Since the cups were designed as easy to bring along, they can fit most car cup holders. A standard 1-year warranty comes with every purchase. The Nutri Ninja also has stainless steel blades that are sharp and add cutting power to its strong motor. All of the parts are dishwasher safe and cleaning it is as easy as squeezing 2-3 drops of dishwashing soap, then filing it halfway with water and pulse 5-10 times. The Ninja Master Prep Pro System QB1004 combines their patented Ninja technology and powerful pulsing action, which makes it a handy tool in the kitchen. The product includes a 48 oz pitcher perfect for smoothies, a 40 oz bowl for food processing, and a 16 oz bowl for chopping. All jars include a convenient cover for easy storage. It’s powered by a 450-watt motor pod which you place on top of the jars and it doesn’t act as a base like other blenders. It is powerful enough to do different functions effortlessly such as mince, chop, dice, blend, and puree without making soggy end results. It even crushes ice into fluffy snow for creamy frozen drinks and desserts. This model also has another lower power motor which is 400 watts and cheaper in price too. The pitcher and bowls have different sets of stainless-steel blades and splash guards designed to fit each container that is made of BPA-free SAN Plastic. The 48 oz pitcher has a set of 6 blades which is enough for its large capacity. The 40 oz bowl has 4 fixed blades. And the 16oz chopper has 4 detachable blades. All of its parts are safe to put in the dishwasher except the pod and cleaning it is very easy and simple. And although it is mighty in making purees and frozen drinks, it is not designed for hot liquids though. As usual, it has a 1-year standard warranty come with every purchase. 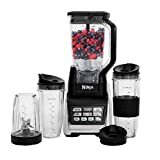 The Nutri Ninja Ninja Blender Duo with Auto-iQ BL642 comes with an extra-large capacity 72 oz pitcher blender and Nutri Ninja Tritan-made cups that come in 18 oz, 24 oz, and 32 oz sizes, each including a sip and seal lid. It is powered by a 1,200-watt motor base that can crush ice to snow within seconds. This product features the proprietary Shark Ninja’s Auto-iQ technology lets you use 4 preset pulsing cycles to lessen your time in making smoothies, but you also have the option to manually pulse it. Its 4 functions are ultra fine, blend, smoothies, and puree. It allows you to add your ingredients and blend your drinks with a press of a single button. This feature plus the smaller cups that fit cup holders is perfect if you have a busy schedule and are always in a rush. The blender comes with high-quality stainless steel blades that are rust-proof, keeping your food safe and your mixer sturdy. These can cut through frozen fruits and vegetables and extract the most vitamins and nutrients. This is a better option compared to traditional juicers that remove the pulp which contain the healthy fiber. Unfortunately, this blender doesn’t have different speeds compared to other mixers, but overall, it is an excellent blender that can crush frozen ingredients with its powerful motor and sharp blades. It is the best blender for vegetable smoothies because it is designed for recipes specifically for this purpose. As usual, it has a 1-year standard warranty come with every purchase. The Nutri Ninja Auto-iQ Compact Blending System BL494 is the newest model among the series and offer a complete blender system. It has a powerful 1,200-watt motor and comes with their Auto-iQ Boost technology that allows you to create drinks using Ninja’s pre-programmed settings conveniently. These programs are the puree, mix dough, extract, smoothie, and frozen drink. This model comes with a 72 oz blender pitcher that has a Total Crushing blade for crushing tough ingredients like ice and frozen produce in large quantities. It also has a 40 oz bowl for chopping, dough making, and preparing meals. Other than those, it has 2 24 oz BPA-free Tritan Nutri Ninja cups with lids for on-the-go smoothies. The BL494 comes with 1 pro-extractor blade to be used with the cups, 1 chopping blade, and 1 dough blade. Just like the previous blenders, these blades are made with high-quality stainless-steel that cuts through the hardest ingredients without making it soggy. And you can use the included 75 recipe book to create your own drinks. Overall, this the BL494 is an excellent addition to your kitchen especially if you want a multifunctional blender and meal prep equipment. Because it comes with different containers and blades, it is very versatile and can function with any ingredient. This is also one of the best ninja blenders which you should include on your shopping list. You get many functions in one product and for a very affordable price compared to other mixers. Like other models, it has a 1-year standard warranty come with every purchase but you can have the option to purchase an extended warranty at a minimal cost. If you are on the lookout for a blender, then doing research and reading reviews can help you pick the right one. Here are some questions you should ask before purchasing one. Function plays a significant role in choosing the right blender for you. Think about what you will use it for. Most blenders can crush ice, frozen fruits and vegetables, and make smoothies. However, some blenders offer more than that and can function as a food processor, dough mixer, chopper, and more. There is some newer model on the market that can even let you cook soup like the Cuisinart SBC-1000 Blend-and-Cook Soup Maker. Each line has different models and each one has unique features and accessories. So before buying, it’s important to read the features of a model you’re considering buying. Although more features may mean additional cost, these can also help save your time. Size also matters in picking the right model. If your intent to work with large ingredients or blend in large quantity, then getting one with a large container will be useful as you can create drinks like smoothies for many servings. For a single serving, then getting a smaller model with single serve cups will suffice. The form factor of a Ninja Blenders is not big; hence, it does not take much space in the kitchen. However, this is also something to look into when buying one because food prep needs a certain amount of space to chop up your ingredients comfortably. Also consider where you will keep your blender when not in use, whether you will keep it on the countertop or in the cupboard. Make sure to allocate a room large enough to store the blender after use. Like we said earlier, more features may mean added price to a blender. That’s why carefully weighing your needs is vital in knowing your budget. Despite a higher cost, multifunctional blenders for the price of one can be an excellent deal in the long run. If you are considering buying a Ninja Blender, our suggested models are all worth considering and choosing one depends on your needs. Each model has different features, functions advantages and the downside, and we hope our review helped you pick out the best one to use. Overall, Ninja Blenders are great products and worth your investment because it is a more affordable option compared to other brands. However, looking at our review and buyer feedback, the Nutri Ninja Auto-iQ Compact Blending System BL494 can be considered the best Ninja Blender because of its multiple functions and versatility. Despite its price, it is still affordable that other blenders and you get the best blender and juicer all-in-one features in one compact product.